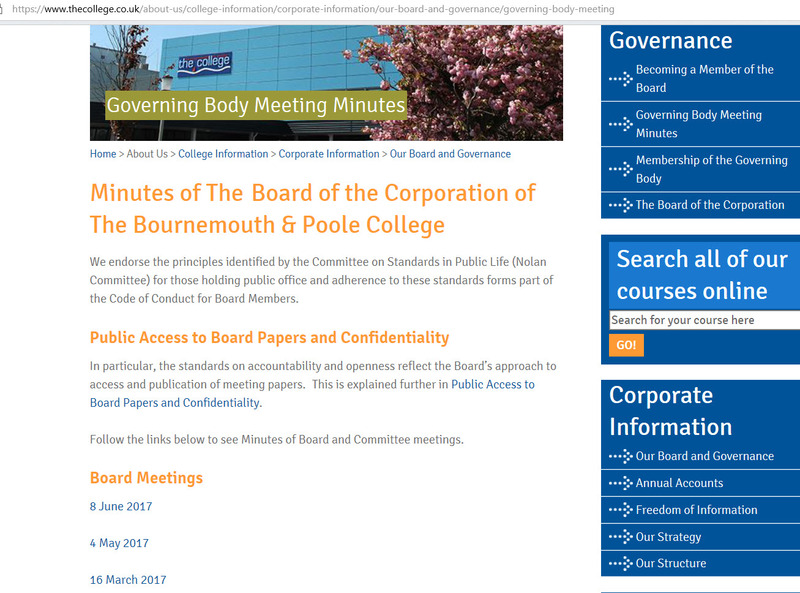 No Bournemouth and Poole College Board minutes published for the last 6 months? (Post made at 1903 on 1 Dec 2017 in a personal capacity. Please see here for important background and disclosure of interests). Subject: No College Board minutes published since June? The College website states that it endorses the Nolan Committee principles (*) for those holding public office, and in particular that minutes of Board meetings will be published on the College’s website (**). Please will you explain why no minutes have been published for the last 6 months (since June 2017, as shown in the screenshot below), and when the missing minutes will be published? Subject: RE: No College Board minutes published since June? Minutes from the July & October 2017 meetings which were recently approved will be uploaded to the website this week.